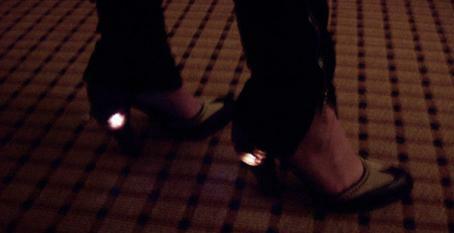 As promised, here is a more robust update to the Rodarte's light-up heels that was posted two weeks ago. I used the LED sequins from Aniomagic, you can find them here. The battery pack is from Switch Craft, the materials below account for this. You can use a different battery holder if you like, both Aniomagic and Lilypad's battery holders work well. Saran Wrap or lightweight sheer fabric. 1. 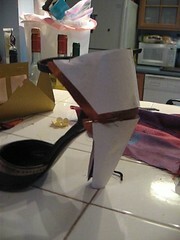 Make a pattern for the height and width of your shoe heels with paper and pencil. Make one pattern for the back of the shoe and one for the heel itself. When you are done, the shapes should look somewhat like the patterns below. 2. Cut 2 top-heel patterns out of your main fabric, cut 2 bottom heels out of your main fabric and cotton lining. Fold under and stitch the top and sides of your top heel pattern and set it aside. 3. Sew in your LEDs to the cotton lining, following the diagram below. It is important that you use a singular thread for each (+) and (-) side of the LED. This means that you will have two threads meeting in the middle. Pull them through to the other side of your fabric and tie them in a knot, leaving about 5” of thread left over for use later. I’ve used red here to indicate the (+) side of the LED and black to represent the (-) side of the LED; however, your thread will be gray or silver. 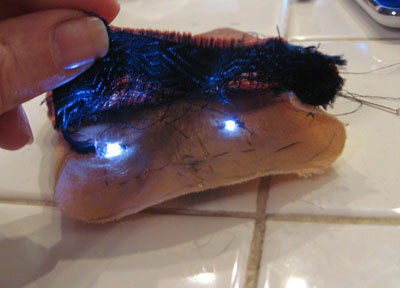 Sew in the LEDs for each shoe heel pattern. 4. With right sides together, sew the lining fabric and main fabric together on the sides and bottom. Leave the top open. 5. Turn your bottom-heel pattern you just sewed right side out. If you are using the Switch Craft Power Pack for your battery: sew on your jewelry clasps to the two threads left hanging on the outside of the cotton lining. Sew a Gold clasp to the (+) threads and a Silver clasp to the (-) thread. If you want a soft diffused effect like they have in Rodarte, stuff some saran wrap or your sheer fabric into the newly made heel pouch shape to help create some space between the two fabrics. 6. Close the gap of your pocket-like shape and sew the top and bottom heels together. 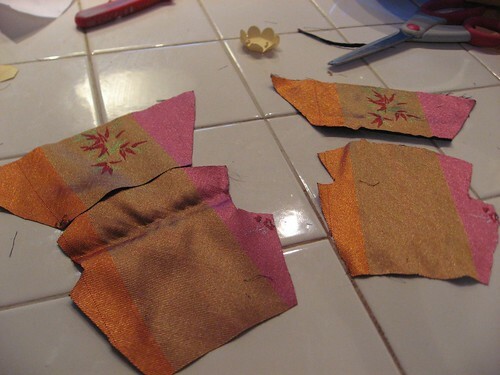 Depending on your pattern, you may have to pin and gather the two sides together to ensure a nice curved fit. As you can see in the diagram below, the battery pack connects on this side of the pattern. 7. Fold the shape around your shoe and test for a proper fit, then topstitch the flaps together. Finally topstitch your ribbon to the top of the shoe patter, make sure its long enough to tie around the front of your shoe (pick a length that suits your style). Insert your battery and let your heels shine. If you look at the pattern, you can see that there is a ribbon around the top. You slide the lighted fabric onto the heel and tie it on in a bow in the front. It is a light accessory and can be removed anytime. If you want it to be on permanently, then you may want to glue it on with some leather or strong epoxy. How do you keep the material on the shoe? I really appreciate these small projects a person can do by themselves. Especially, in the case of this one, it can be applied to other items in useful ways. Thanks. Step 3 to step 5 above demonstrates how to add a pair of LEDs with a power source. Repeat these steps to add another LED pair and one more power source, but put them on a slightly different location this time. Want another pair? Repeat the steps again. You can keep adding more until you run out of space. Safety warning: Each set of LED-battery circuit must be separate from one another. Absolutely no wire (conductive thread) crossing! is it possible to put multiple lights on and if so how? 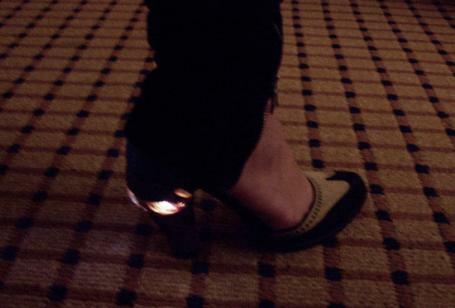 super cool - I like how you can take the lights off later if you want your "normal" shoes back! NOTICE: I wanted to use this pretty brocade fabric I had, but it didn't let any light shine through. To combat this issue, I pulled out the dark threads from the wrong side of the fabric. It makes a lined pattern along the back of the shoe, but it works. This is a time consuming method, but works if you are in a pinch!